After six brutal years for buyers, everything is moving in their direction: prices are down, inventory is up, there's less competition and even interest rates have started to tick back down again. The cool-down in King County’s real-estate market has now reached six months, and the drop in home prices over that span is among the largest on record. 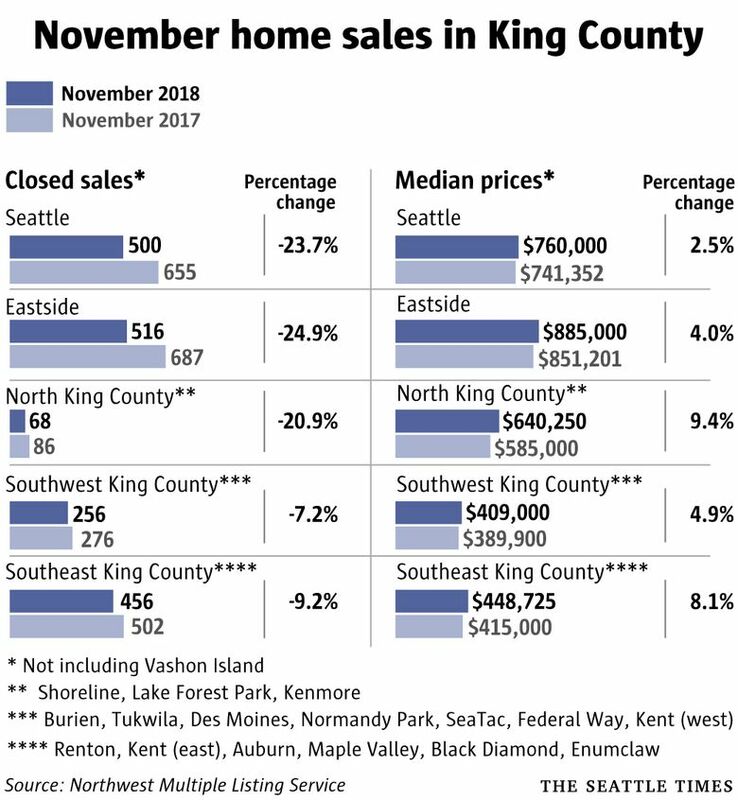 King County’s median single-family home price fell to $644,000 in November, all the way from $726,000 in the spring, according to new figures released Thursday by the Northwest Multiple Listing Service. Prices have been falling faster here than anywhere else in the country. The price drop equals 11.3 percent over six months, more than any May-to-November stretch since such data has been tracked. The biggest six-month decline for any time of year happened after the housing bubble popped last decade and prices plunged 14 percent. Of course the difference is that home values continued to plummet for years in the last bubble, while there are few early signs of such a prolonged downturn this time. Regardless, the market continues to shift in buyers’ favor. Buyers also are seeing far more homes to choose from. 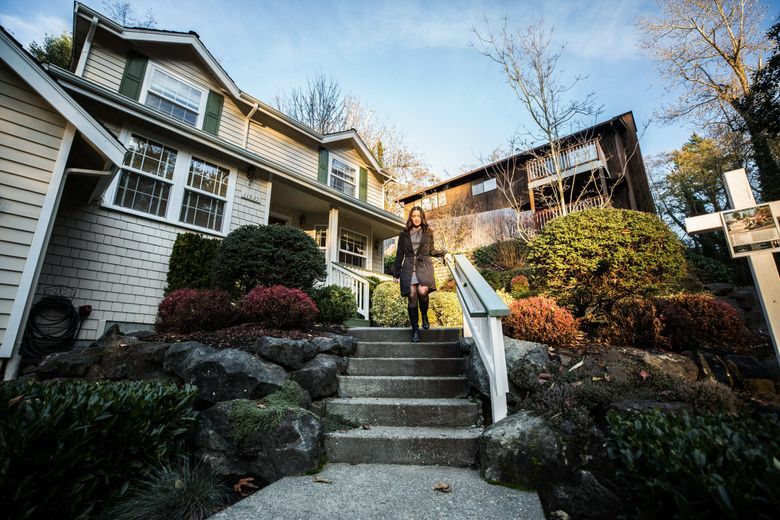 Countywide, the number of houses on the market jumped 114 percent year-over-year, easily the largest gain on record dating to 2000 — led by a whopping 177 percent increase in the city of Seattle. The last three months have now featured the three biggest increases in inventory since at least 2000. The trend is entirely attributable to more homes sitting on the market unsold, as opposed to more people putting homes up for sale. For condos, inventory more than tripled in the past year, while prices are down $61,000 from the spring. Sales also continued to plummet, down 19 percent in the past year. It was the seventh straight month that fewer people bought homes. In another nice shift for buyers, mortgage interest rates, which had been on a steady climb for much of the year, have fallen back down recently. 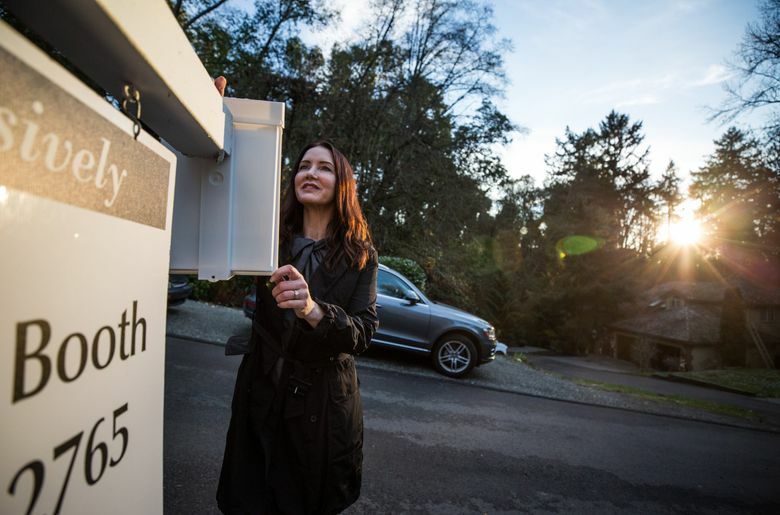 “It’s a little bit of a herd mentality,” said Sabrina Booth, a Windermere broker in Seattle. Before, buyers were rushing to outdo each other by engaging in frantic bidding wars and signing away rights like inspection clauses. Now, they’re often taking their time, negotiating prices down and getting sellers to pay for fixes to their homes. 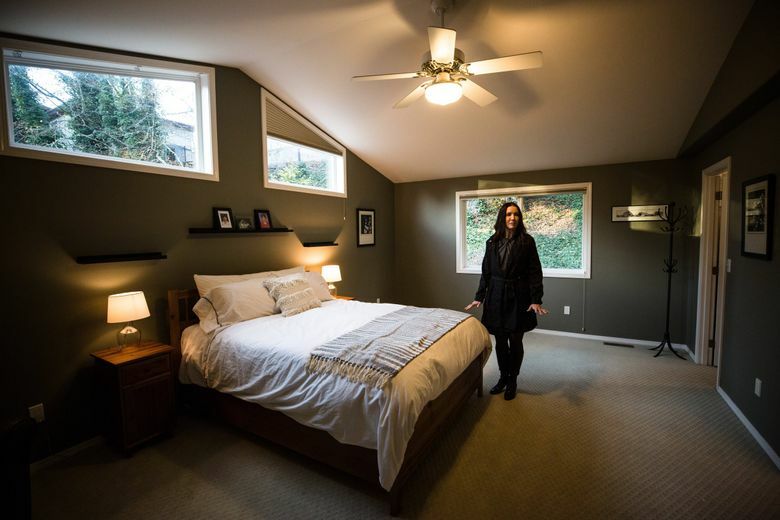 Stelina Simpson recalls selling her Ballard home three years ago with five offers all above list price, including one all-cash, a few days after it went on the market. Then she dealt,with the same frenzy when she turned around and bought a house in West Seattle. Recently she’s begun looking for a trade-up home and has had a completely different experience. Compared to a year ago, home prices were still up 2.1 percent across King County, but that was the smallest increase in four years and amounts to a small decrease on an inflation-adjusted basis. And it’s a far cry from the average 10.1 percent year-over-year growth from the last six years. Prices in several Seattle neighborhoods, however, were down from a year ago. Among these were Southeast Seattle, Sodo/Beacon Hill, the Capitol Hill/Central Seattle area, Queen Anne/Magnolia, the Ballard/Green Lake area and downtown. Other places where prices dropped on a year-over-year basis in November: East Bellevue, the Eastside area south of Interstate 90, Richmond Beach-Shoreline, Jovita-West Hill Auburn and Renton-Highlands & Kennydale. When compared to the peak spring period, median prices have fallen more than $100,000 in the Capitol Hill/Central Seattle area, Queen Anne/Magnolia, Richmond Beach-Shoreline, the Eastside south of I-90, East Bellevue and Redmond-Carnation. The median price of a home in November hit $760,000 in Seattle and $885,000 on the Eastside, both down about $70,000 to $75,000 from their spring highs. In the past month, prices actually ticked up slightly in Seattle and went down a bit on the Eastside. It’s important to note the slowdown has not done much to counteract the booming market in the past half-decade that made Seattle one of the priciest places in the country — in other words, most people who were priced out of the market will still struggle mightily to afford a home here. And the increases in inventory, in particular, look outsized because they are being compared to record lows reached last year. Prices have still soared 109 percent since bottoming out in early 2012. That’s down from a peak six-year rise of 136 percent reached in May. Here’s another way to look at it: For the median house in the county to reach 2015 levels — roughly half a million dollars — the current rate of decline would have to continue uninterrupted for another two years. The consensus among brokers is that the slowdown is likely to continue for the next few months because the winter is almost always a slow time, and the key will be whether things pick back up in the spring when buyers usually come out in full force. Kyle Dominick and his wife bought their first home in West Seattle a couple years ago and had to deal with the frantic market at the time — they lost five bidding wars, at times by more than $100,000. But now they’re looking to time the slump in the market to acquire a rental house in South King County. In absolute dollar terms, although not percentage-wise, the $82,000 price drop in King County over the last six months is easily the most ever for any half-year span, a function of how high prices have gotten. Compared to just a month ago, prices decreased $27,000, which is not a normal seasonal change; over the last several years, prices typically stayed flat from October to November. The cool-down is also starting to spread to the rest of the Puget Sound region — inventory is up and sales are down by double digits in all four local counties. Snohomish County’s home costs have dipped from $511,000 in the spring to $470,000 now. Looking back a full year, prices were still up 5.6 percent, while inventory has surged 88 percent. In Kitsap County, the median home sold for $330,000, up 6.5 percent in a year but down $34,000 from its spring record. 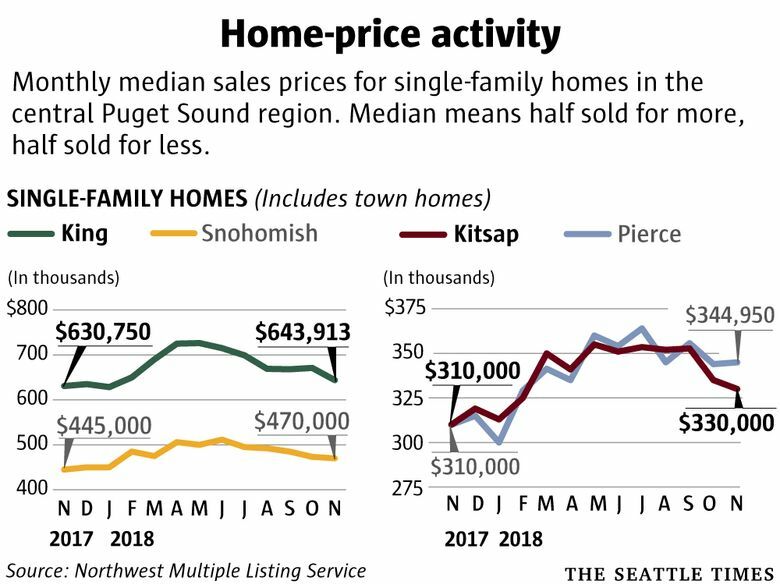 The picture is more complicated in Pierce County: The median price of $345,000 was still up a robust 11.3 percent from a year ago and is only about $10,000 shy of its high-water mark from earlier this year, a typical seasonal decline. 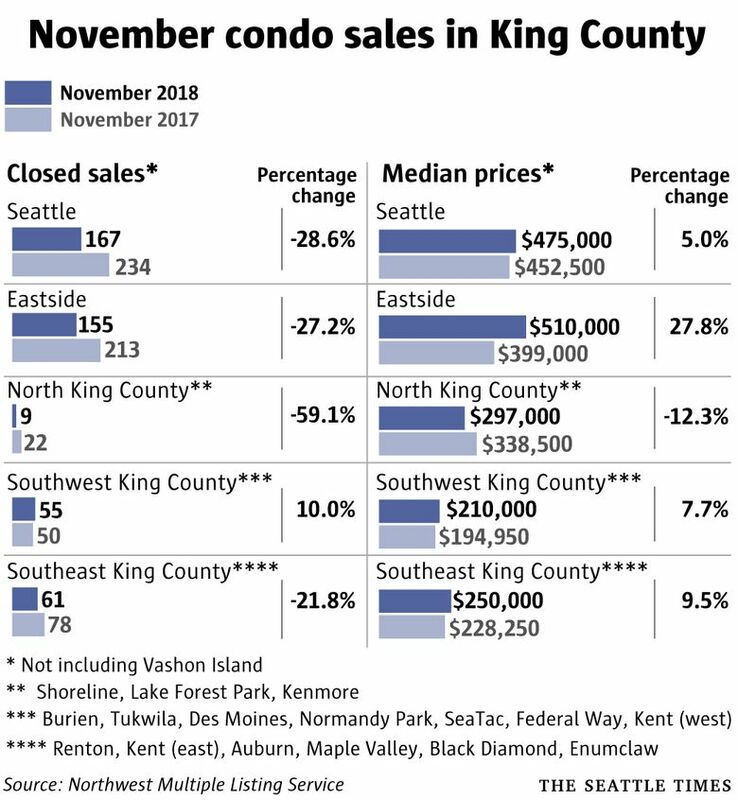 Correction: This story has been updated with a corrected version of the chart for November condo sales in King County. An earlier version showed home sales.